While our waters cool off Fort Lauderdale, the late fall Dolphin have been gracing us with their presence. The wrecks, both deep and shallow, are also performing well. And some other stuff mixed in. Here’s the rundown. While a “rip” is any type of quiet water on one side and current on the other, this is just one attraction that leads us to Dolphin. Any kind of flotsam, weed beds or even just a color change can hold fish. Lately we’ve been finding a stringy type of sea grass holding Dolphin within just a few miles from shore. Only a few throw backs, most are in the 5-10 pound range with a few nice sized gaffers. Always a popular fish with our guests for both the fight and table fare. It is probably the most requested fish. Come toward shore just a mile or two and you are fishing back in the reef area. Kingfish, Tuna and Sailfish have been caught in this area. While they are thick, they have been biting with regularity. The kings have been small unless using live bait. That can produce some of the big ones! Our drift boat, the Lois Ann, has been having great luck with small Kings. Many are throw backs because of their size but certainly a thrill to catch. Daytime drifting has also had good catches of Trigger, Mutton Snapper and some good sized Yellowtails. The evening anchor trip has been having good catches of Mangrove, Vermillion and Yellowtail Snapper. The crowds have been light so there’s been plenty of room. No matter which type of fishing you do, you can expect some good results. And we’ll be looking for those late fall Dolphin until the trend changes. With the time change firmly in place now, I get a glimpse of the sea as I come over the bridge on my way to the charter boat dock. The sun is too low for a look at the color. But sea conditions look nice even though the wind is blowing. I arrive an hour or so early before the trip. But some days, our guests are just as early. Anxious with anticipation and excited about their charter boat trip. As we prepare for our day we have a chance to find out our guests expectations. Some really don’t care what they catch. Something to eat would be nice, maybe a BIG fish. Others have prepared a semi shopping list, specific in their wants of what is to be caught. To this I can only respond that we are going fishing, not shopping. LOL We’ll still do our best to fill their bill. It seemed the day went by in a second. Before I knew it, we were on our way home. Mahi-mahi and Kingfish for were dinner. A nice Barracuda was released and some other hits on our live bait. And while everyone on board caught fish and had a great time, I wanted more for these folks. I always do. Super nice and full of humor was the theme of this outing. And that is what charter boat fishing is all about. Tomorrow I will watch the dawn break again on my in to work. I’ll meet my guests. Will it be you? It has always amazes me how much sea conditions can change, and how quickly, as they did in this week’s fishing. And with these changes come different types of fish you can catch. North current can change to none or south in minutes. Water color can go from blue to green or vice versa quickly as well. Many times that green water has to do with rain as it did the other day while catching bait. The Ballyhoo came to the chum bag quickly but would not come to the surface for quite some time, the fresh water keeping them down a foot or so. This week’s fishing has been very good however, even with these changes. Bait is very thick migrating through the area and has Dolphin and Tuna in close to shore. Live bait has always been the most productive for Dolphin but trolling gives you the ability to cover ground and find these fish. As our sea temperatures drop, this will change and mostly live bait will be the big producer. Sailfish activity is also on the rise. At this time of year, the smaller, younger Sails frequent shallow waters near the reef. Some bigger Sailfish are a bit further off shore and again found on the troll. All in all it is a great time to be out there catching fish as you can see in the picture. Andrew and his new wife Jessica had a great day with us catching a variety of fish. They could only hold 4 for the picture on the way in. This week’s fishing has been good. We’re expecting the same for the next few weeks. Our first cold front is passing through the Fort Lauderdale area as I write this fishing report. And just those few degrees less are already making changes in our fishing. The biggest change is our sea temperatures. If you’ve ever snorkeled in warm waters like we have here in the summer, as you return to the surface, you go through a thermocline. The water’s surface is much warmer than the sea beneath it. Looking through your mask, it appears as if someone smeared Vaseline on glass, it gets blurry. Being cold blooded, fish don’t care for that temperature change or blurred vision. As the days get shorter with less sun and the cooler air temps, the ocean surface is closer, if not the same, as the water below. This increases a fish’s ability to feed on the surface. So we go from depending on our deep lines for bites to most everything we have out. Another plus is north winds. North winds create swells that allow some fish to be helped migrating south. Specifically, I’m speaking about Sailfish. With winds from the north, they can “surf” the surface of the wave. This is known as “tailing”. It’s time to stop trolling and get the kites out! But that’s what is coming soon. What has been happening is some good Dolphin and Kingfish action. The bottom fishing has also been producing some good sized fish as is in the picture of this group from Denver. 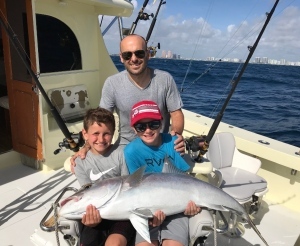 Nolan, the smallest, caught this Greater Amberjack, with help from dad and his brother. Grouper and a few early Cobia are also being caught. With a bit of tropical wetness coming tomorrow and another cold front on its heels? Well, just going fishing in low 80’s will be a pleasure. As for what we will catch? Let’s find out. While the Fanntastic Fishing website is primarily about sport fishing we also have a drift boat. Today we will talk about the Lois Ann, our drift fishing boat. The Lois Ann, a 65’ aluminum craft, is designed as a head/ party/ drift boat that carry up to 60 passengers. While we don’t have a full kitchen aboard Frank manages to put out hamburgers, hotdogs and a variety of breakfast and regular sandwiches 5 days a week. Assorted snack and drinks are also available. But the Lois Ann is more than just a drift fishing boat. 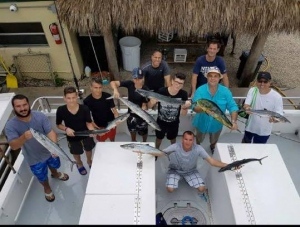 Many corporate groups of over 6 passengers use the boat for sport fishing. The outriggers are put out, the kites fly and pretty much anything a conventional sport fish can do the Lois Ann can. But the main thing is the fishing! And fishing is great right now. When conditions are right for drifting, Kingfish are biting well. We’ve also been catching Mahi-mahi in fairly close to shore as you can see in the top picture. Bottom fishing has also been great. 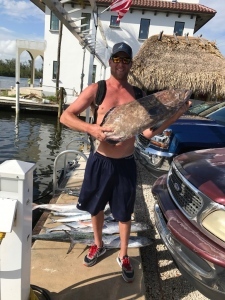 You’ve seen what the charter boat has had recently but the drift boat fishing the same areas and have some good success. 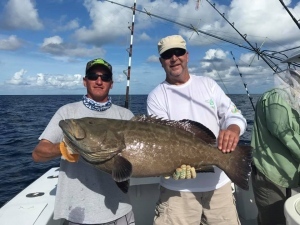 One very large Black grouper and another legal Red Grouper top the list this week. Now, the evening anchor trip focuses on snappers. Yellowtail, Vermillion and Mangrove are the targets after the sun goes down and the 5 hour trip has been doing well. They have even been known to come in early because the limit of fish has been made. Captain Jimmy, along with captains Adam and Patrick are the boys that run the trips. Anthony and Dom are the deck techs and helping people with instructions, baiting up and landing their fish. So check out the Fanntastic Facebook page from time to time. 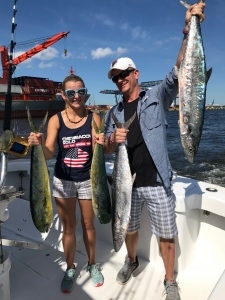 https://www.facebook.com/Fanntastic-Fishing-1476203306014764/ The Lois Ann along with our sport fishing charter boat are both featured. We have had an interesting week here with a Tiger Shark making one customer very happy. But I’ll get to that in a moment. Our week begins with calm seas, light west winds and some great fishing. 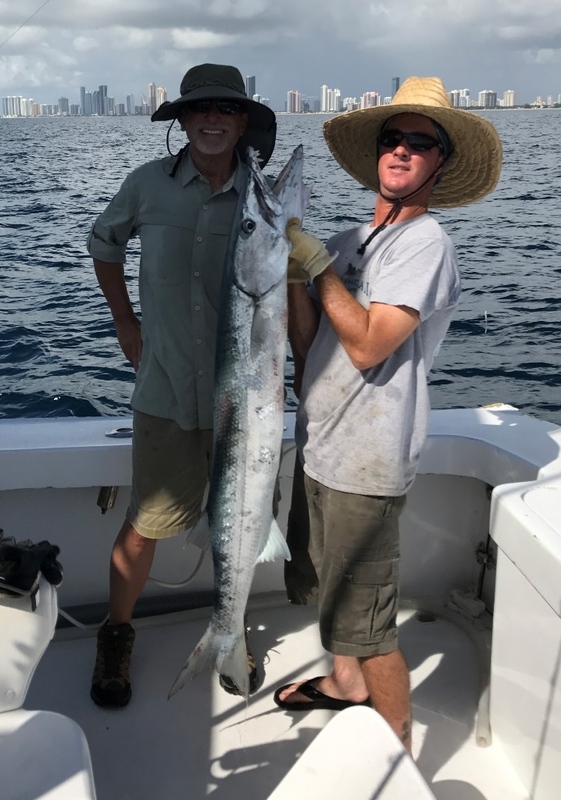 Trolling on the reef produced good catches in Kingfish, Skipjack Tuna and lots of small Barracuda with a few big ones mixed in. Because of the west wind, weed and other debris that hold Dolphin and Wahoo were further off shore and hard to reach on the shorter trips. Bottom fishing on the deeper wrecks has also been very good. 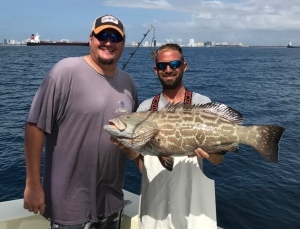 Black Grouper are moving through our area. We’ve managed at least one per trip and 3 on out last all day. We’ve also lost a few back into the wreck. Medium sized Amberjack are also somewhat prevalent with this kind of fishing. But even a day with a great catch isn’t always good enough. Not if your heart is set on catching a shark and that’s what Jordan wanted. So with just an hour or so to go, we put out the big baits. And as time grew near for us to go in and still no bite? They extended their trip another 2 hours. We had been picking at small bottom stuff while fishing for the big one. Tilefish, Vermillion snapper and Tinker mackerel were biting. Our bottom bait had been decimated by the small fish so we freshened the bait and waited some more. And then it happened. The bottom rod bent over sharply. And that was all, it was back to resting peacefully. Really??? Again it bent down hard and then… nothing. Oh come on! 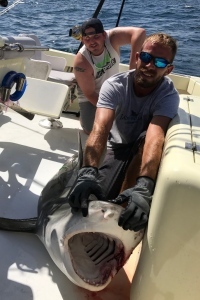 The third time was the charm, we were connected to something and we would find out in about 40 minutes with a lot of straining that a Tiger shark had taken our bait. He measured at 1” shy of 8’, was tagged, photographed and released. Check out that mouth. Our weather has cleared and we’ll be back out fishing. Won’t you join us? It has been a while since my last fishing report. The last month or so has been preparing for Irma, moving the boats and securing the dock. Then waiting for the storm and weathering that. Once it had passed, bringing the boats back to the dock that thankfully was still there. Traveling on both water and roadways was difficult, debris from the storm in the river and waterway as well as loss of the electric. And with all the boats intact and back in service, we are again running our trips each day. The ocean is an amazing environment. It needs these kinds of events from time to time. With the last living reef in North America just off our shore, wind and waves help clean the coral of silt. This allows for small fish to have a healthy place to live and we ALL know, small fish attract bigger fish! The reef area has been yielding Kingfish both small and large, Skipjack Tuna and lots of small Barracuda with a few Bonitos mixed in. We’ve also had Sailfish attacking our trolling baits, it’s getting to that time of year. Further off the shore trees, branches and other things have been holding Dolphin and Wahoo. Sailfish have also been in the deeper waters. 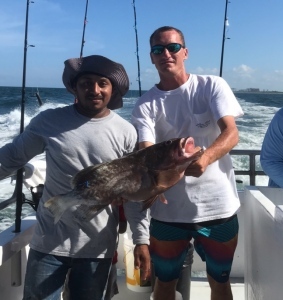 Bottom fishing has been steady with a number of different types of Grouper being caught as well as some snappers and Amberjacks. The Black Grouper in the picture turned out to be my dinner the other night. Our guests were flying out that afternoon and didn’t have time to enjoy it. Sean and I sure did though. Yes, we’re back catching fish and having fun. The upcoming couple of months are a great time to be out there catching what is migrating south. Our daytime Swordfish trip ended a great week of Fort Lauderdale fishing. Schoolie Mahi-mahi invaded our off shore area with large amounts of seaweed making it hard to keep baits clean. But when they were clean, the fish had no problem biting well. 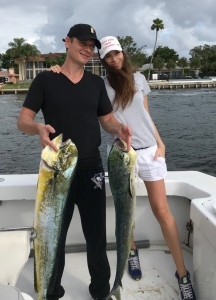 With all this great Fort Lauderdale fishing action, I was quite excited when J. R. and his wife Nicole came across the state to go daytime dropping for Swordfish. With near calm seas and a bright sunny day we were off with high expectations, at least Hunter and I were. LOL JR expected nothing but a nice day. There was an area we could have fished on the way out, it looked great for Mahi, but we continued a bit further. Our ultimate goal was a Sword so we pressed on. Another area we found looked promising and we fished a bit but things thinned out so we again pushed for the Swordfish grounds. Our first drop hit the water at 10 am. We were connected at 10:20! Hunter had just finished explaining how the electric reel we use worked when the rod tip tweaked. JR smashed the button and the rod bent over hard! Since we had just found the bottom again and come up a bit, I feared we had hung something. With 3.5 knots of current and over 2400’ of line out? It’s not always easy to tell. But we were connected to a fish and a nice one at that! We gain some and then lose some, overall retrieving more than losing. The weight finally appeared and was removed only to have the fish take a few hundred feet of line from us. Keeping the fish stretched out away from the boat, he finally gave in and got close enough for the perfect dart shot from Hunter. That video is also on our Facebook page. Fishing with women is a bit different than fishing with the guys. 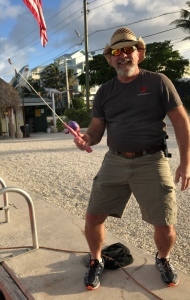 Trying to teach fishing techniques in just a few hours can be tough. Men have strength that they rely on but most women prefer to listen to instructions and use finesse to do the job. In other words, they are more willing to accept help from the gear and the mate. Sheryl was on our morning trip, a slight woman of 100 lbs. or less. She was just along for the ride and to take pictures. This trip was having great action from the Bonitos and Kingfish and we finally got her to accept a rod with a small baitfish on it. She was actually thrilled with what she’d caught. And her fish was put in the tuna tubes and kept alive. As our day went on we came to a deep wreck where we decided to use her baitfish for a deep drop. 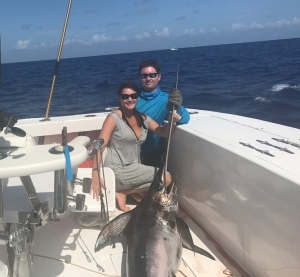 It only took a minute or so before the hit came and this slight woman was hanging onto a 130 International with an unlimited rod bent down toward the water. She kept saying she couldn’t do it but with encouraging words from Mitch, the mate of the day, 20 minutes later she had landed a fish that was 2/3 her weight! 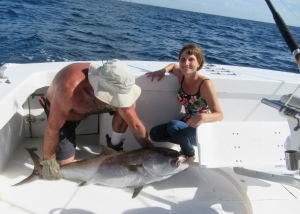 And though tired, she was quite proud… Here is Sheryl and her Amberjack in the picture. Our afternoon trip had Gail, her husband Tim and their son. Yet again those words of “I’m not here to fish” came along. While the action wasn’t as good as the morning trip, probably because of the changing weather and rain, we were still catching fish 3 and 4 at a time. We NEEDED her! LOL And she jumped in. 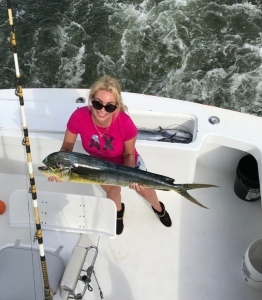 At one point, in pouring rain, she was laughing and a few screams when the fish would run, as she worked the reel and rod again with Mitch’s help. There are many things that make a great deep sea fishing trip. The first, of course, is fish. 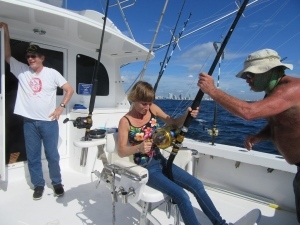 But just catching fish doesn’t always make a great deep sea fishing excursion… unless you have the right people. It just so happens those people were on board today. They hadn’t done any ocean fishing and didn’t have much experience with fishing at all. Our rods and reels are a bit heavier than what most people use in fresh water for Bluegills and Perch. 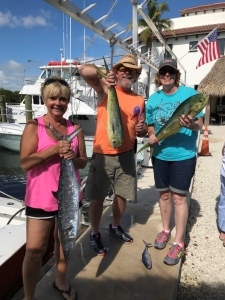 So we ventured out to sea with 2 Bob’s, Sean, Luanne and Doris for their first, and hopefully, great deep sea fishing trip. And to say the fish were biting is an understatement! With only one line in the water, Captain Adam turned to put out the second line and we had our first strike! A nice sized Kingfish was on. Directions for using the gear had already been done but some adjustments were refined as we began catching fish after fish. A few were lost and as most folks do, they asked if they had done something wrong. When the fish bite like this? Really, who cares if they did or didn’t. Have fun and enjoy the action. And this went on for quite some time. Meandering south to fish a wreck we like, we caught fish most the way. Our warm weather had our guests happy when the action slowed, they had time to drink some water or a beer. We had a few of the Bonitos we caught in the tubes alive for bait at the wreck. It was time to try for something big! Our first bite on the livie came instantly! We’ve no idea what it was other than big! It broke the wire and we took time to re-rig for another try. 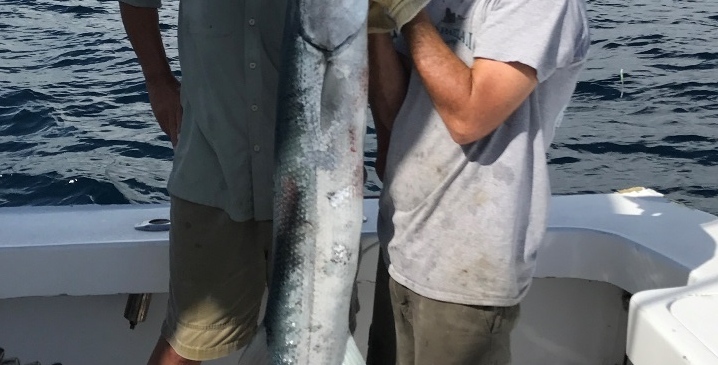 This time we connected to this huge Barracuda. It turned out to be a bucket list thing for Bob #1 and his prize is pictured at the top of this report. A real stud fish and a very happy Bob! Another wreck produced a large Amberjack and with our box teaming with fish, we began our trip home.